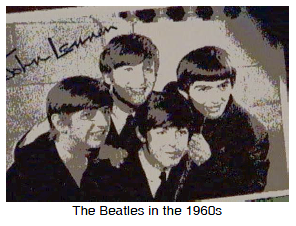 1960s - The Beatles became internationally famous in the sixties. They started in Liverpool, England and played at clubs there and in Germany, but it was after their appearance on the Ed Sullivan Show that their popularity spread to this side of the Atlantic. Parents were shocked by their long hair which was shaggy compared to the fifties crewcut, but when men's hair went below the shoulders in the seventies, the early Beatles looked "clean-cut" by comparison. Their studio recordings under the direction of George Martin (called by some, the fifth Beatle), brought classical orchestration to the basic good melodies and created the rich sound which we are familiar with today. Paul McCartney and John Lennon (who was assassinated in 1980) were the driving forces and main song writers of the group. George Harrison also wrote some of the material and was the best guitarist. Ringo Starr, the drummer, rounded out the Fab Four. Discounted by some as just a passing craze, Beatles music has endured and is still very popular. 1960 - Fashion in the sixties was also going through a revolution along with the music. Again England enjoyed a resurgence as the centre of many of the trends. Mary Quant was a popular designer and the boutique row, Carnaby Street, in London, was known around the world. Mini skirts began to appear and straight shift dresses in bold patterns were popular. Art took to fabric with the geometric designs of Dutch artist Piet Mondrian (1872- 1944) being reproduced on dresses. 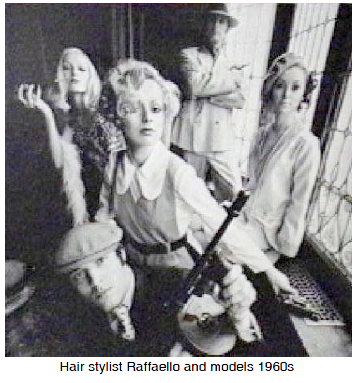 Bell-bottom pants were all the rage and copious amounts of hair spray kept those beehive hairdos in place. 1964 - Marshall McLuhan published Understanding Media: the extension of man, his insightful analysis of the impact of television on society. One of his famous phrases from that book was "the medium is the message." Another often used McLuhanism is the term "global village" which refers to how small and interconnected the world really is. Raised on the prairies, McLuhan became a great scholar in the field of communications and the effects of various media on society. He was lionized by the advertising world and shunned by fellow academics, but his thoughts have proven to be visionary. He died on December 31, 1980.